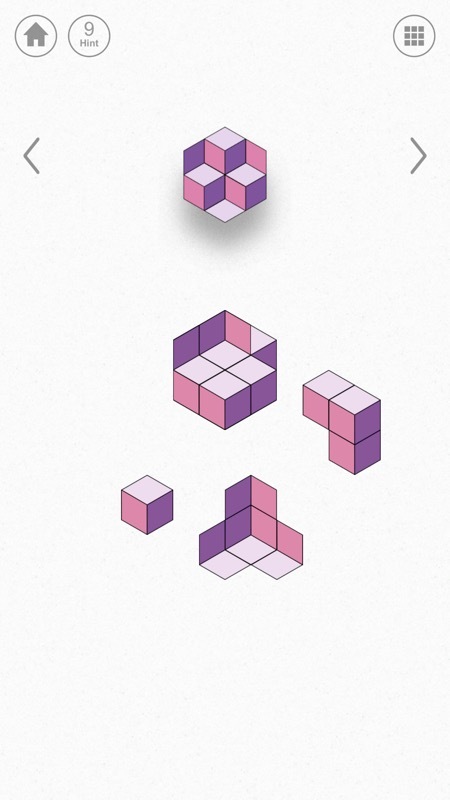 You've seen brain-bending, mind-mangling puzzles before. But never this hard, never this eye-boggling, never this enjoyably frustrating. 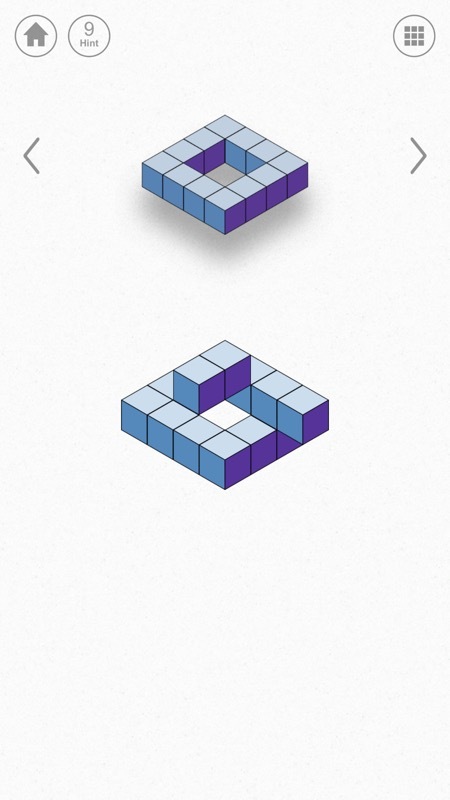 Inspired by the famous optical illusions of MC Escher, nothing in the block puzzles here is quite what it seems. 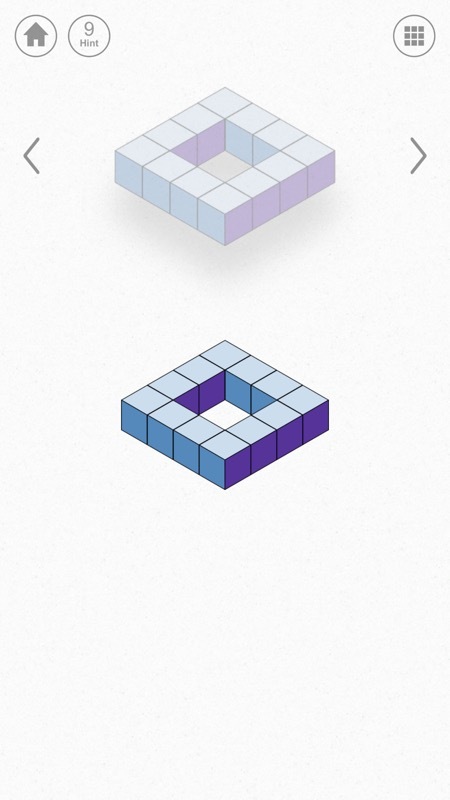 Beautiful puzzles, beautiful music and no time pressure make this the perfect mobile brain-training geometrical puzzle. 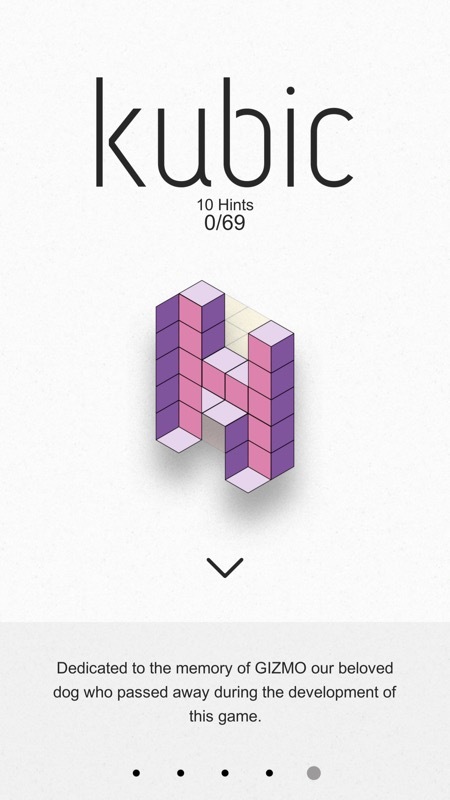 As Kubic's own description says: "This quirky puzzle game bends the limits of space and reality to make you create structures that, in theory, should be impossible to replicate". The thing that makes this possible is the perfect 45 degree isometric angle with which you're viewing the blocks, in three dimensions - are you looking at a section of blocks from underneath - or from on top? Or maybe a mixture? Or is it a structure which is physically impossible, Escher-style? And a tap on a section of blocks brings it (and its facets) to the foreground without changing its position, confusing the eye (and brain) even more - or perhaps solving the puzzle! Got to love a game whose title credits include a dedication to a recently passed pet! (right) just some of the sixty 3D puzzles/structures that need creating! You get the idea, this is not your mum or dad's puzzle game. 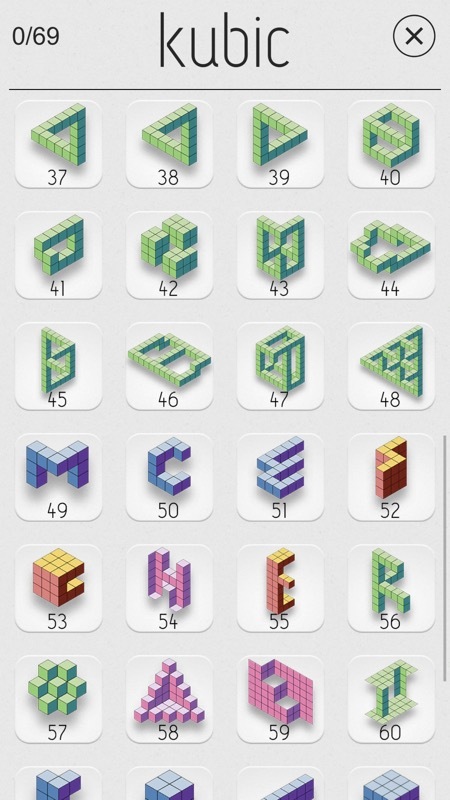 There are 60 carefully designed three dimensional puzzles of increasing difficulty and divided into six categories - to solve them all would require hundreds of hours of gameplay. Usefully, given the difficulty factor, you can tackle any puzzle in any order and at any time - it's up to you. There's no locking of harder levels, etc. All very refreshing and freeing. In each case the target structure (and viewpoint) is shown at the top of the screen, along with either component parts or another structure (in the latter case, you drag and drop its components apart and then together again as needed). All the while soothing ambient music is played, and there's no, repeat no timer, so.... relax! A typical puzzle, en route to finishing, from near the start of the 60 puzzle array. Look at the blocks on the left and try to get your head around their layout in three dimensions. Got it? Now tap on just two blocks to bring their facets to the foreground and the structure is completed. Understand? No, it took me a while too! Happily, if a puzzle is driving you mad, you can request hints, at which point two of the blocks move together in a correct way - two or three hints and you're hopefully close enough to finish the puzzle on your own. You get 10 hints to start with and then the in-app-purchases kick in - but don't worry, these aren't swingeing, they're ultra-reasonable, so well done to the developers, to whom I'm warming the more I deal with this game title. 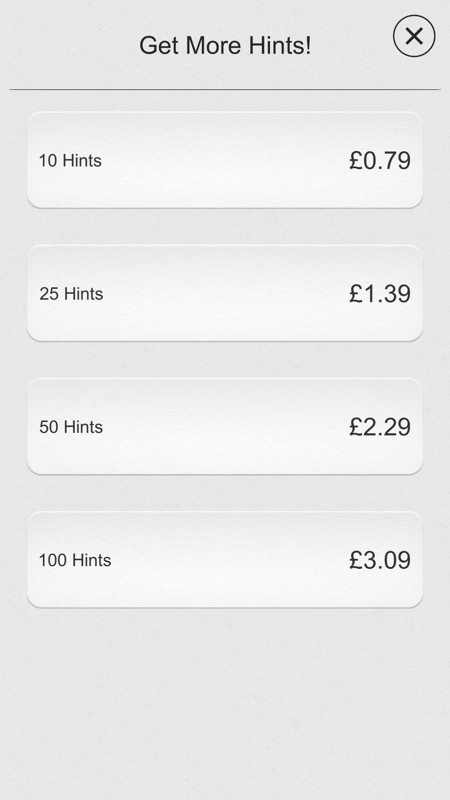 100 hints is enough to essentially complete the game, so hopefully will be all you ever need. Which makes Kubic just over £3 all in, which is an outright bargain. Free to download, localised in no less than 12 languages and super-smooth and super-slick, it's hard not to love Kubic even if you don't normally go for puzzle games. This is also available for both Windows Phone 8.1 and Windows 10 Mobile, so is applicable to all.